Radiall’s experience in rectangular connectors and ability to design innovate solutions resulted in the revolutionary mechanical shape of QuickFusio, which combines the geometry of a square and a circle into an impressive compact and light weight design. Featuring a tool-less locking slide, the mating of the plug and receptacle is simple and offers the Radiall Touch: one finger mating – in a snap! 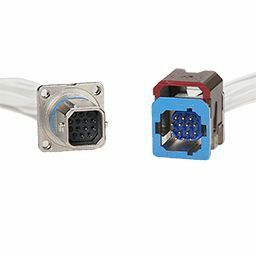 Combining high performance with quick and secure mating, this lightweight cost effective connector is the perfect solution for aerospace harsh environments.